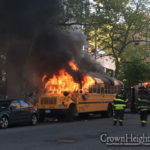 CrownHeights.info has obtained surveillance footage that clearly captured the arson incident which occurred in front of Beis Rivkah Sunday evening, in which a school bus was set ablaze by a group of children. In the video, several children can be seen boarding the bus with scraps of cardboard in their hands. 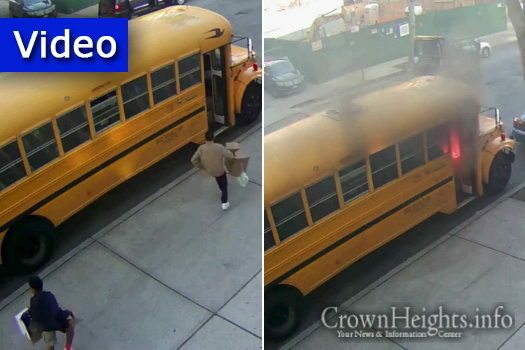 A short while later, a fire can be seen burning towards the front of the bus, and the children flee. The fire soon engulfs the bus. One of the suspects, an 11-year-old boy, was arrested and charged with a hate crime as a juvenile in connection with the incident. Police were able to apprehend the suspect thanks to the quick response of Shomrim volunteers who identified the group and kept an eye until police arrived. Police detectives are confident that the remaining suspects will be apprehended and charged over the coming days. this is absolutely ludicrous. What does it mean police detectives are confident that they will be apprehended and charged over the coming days??????? the police have to be confident to charge them??????? Are you absolutely kidding? Why in heavens world have they not got a consequence yet? and why is this not all over the media????????? These kids have to be exposed. Enough is enough! Which 11 year olds do this?! Which 11 year olds know how to do this?! What are they being taught in school?! all seven animals involved in this incident should be arrested, incarcerated and fined. Also, their pictures along with their entire family should be made public so all can see who they are. Strong measures must be applied to their posterior. Why their family? What did they do? They should be punished and learn their lesson, but they aren’t these hardened mastermind criminals who have committed murder! 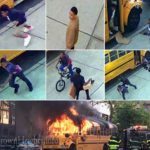 No kids target jewish busses and burn the down unless they heard or saw some hateful rhetoric back home. The Parents should be investigated. This bus belongs to someone I know, and that is the person’s Parnassah and how he puts food on his table. These kids aren’t human. They are animals! They shouldn’t get off that easy. This is terrible! We need more police to protect us from this holocaust. Those evil children were trying to kill all of us and the Jewish children in the school! How can this be allowed to have these ant-semites allowed to be in our neighborhood? The police must stop and frisk all the shiksas and shwatrzas. Seriously. So if one Jew does something wrong that means every Jew is to be blamed and should be treated horrible? What’s the matter with you. There are plenty of good blacks out there. You just don’t see it cuz your focusing on the bad ones. All blacks are not criminals, but all these criminals ARE BLACK…Where is the Jew on black crime? There is none! It’s ALWAYS Black on Jew! WHAT DOES THIS HAVE TO DO WITH ANYTHINF. If it was white kids it would be just as big of a deal. Something much worse could have happened chvs… Close the bus door and lock it for security reasons. BH no one got hurt but this should be a lesson to stop being negligent! This is awful. I am very sorry that this happened to your community. 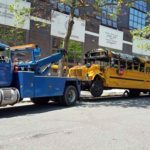 i frequently pass local school buses at night, parked on the street, with the doors sometimes partially open and always unlocked. Where did you kearn English? How do you survive in USA you just totaly misunderstood what the policeman is quoted as saying. He is confident that the responsible people will be caught and charged soon means that he is sure that this will happen. He is not saying that he is waiting untill he needs to be confident to charge them. Well for sure legally he needs probable cause to arrest and charge anyone which implies some level of confidence but that is not what he is quoted as saying above. Thank god a surveillance camera caught these vandals so they can be brought to justice. We should praise the NYPD for their work, it’s the DA and the ADAs that need to be criticized for not following thru with and persecuting charges. It’s these petty crimes when not stoped and or prosecuted that lead to more serious crimes and may lead the (now) juvenile criminals to become adult criminals. This is sooo sad : / Who taught these children hate at such a young age?? Whomever it is is more responsible for this than the actual arsonists. Also really hope the judge goes easy on them…they are just kids after all. Maybe make them do a holocaust workshop and do some community service in our community. But their parents should reimburse the bus company for the damages obviously. Baruch HaShem bais rivkah finally got better security cameras. If this was a few years ago it wouldn’t be possible to catch them this easy. AOL went to the wrong Beth Rivkah location. See video. With todays technology, they should be able to see all the faces. They should all be arrested. It is not only one kid going into the bus. Not only one kid throwing in the boxes to keep the fire going. The one kid caught will roll over on the other ones. He wont take the whole blame and then we will have them all. And this should be a hate crime. Chazal tell us that the mice aren’t the ganovim, the holes are the ganovim. Don’t blame the mice, blame the holes that allow in the mice. these people are needing education on JEWISH lives matter and G-D does help those he need help . so let the bad people learn from this . let them do community service and learn whom we are. civil people not what they think we are.